It had rain overnight and it was dark and muggy when I loaded the car Saturday morning. I had checked the weather radar and there were showers in the area but it was dry for the time being. Gayle and I left the house a little after 5 am. Lebanon, Tennessee is about 50 miles from my house and I wanted to get to the park around 6. The rain held off until we turned off the interstate. We got to the park around 6 and got a great parking space. As I later learned, parking was at a premium. It was still raining, but not hard, as I went and picked up my race packet. Jeff Y. from work was signing in at the same time. Gayle waited in the car as I got my “stuff” together and headed off to set up my transition area. I had anticipated the rain and brought a couple of plastic shopping bags to keep my shoes dry. Because of the rain, everyone seemed to be concerned about the wet road on the bike. As I was setting up saw Greg F., also from work. This was his first tri. Headed off to the pool to do a “practice” lap. The water was cool but not too bad. I headed back to the car to check on Gayle. Gave her the “lay of the land” and headed back to the pool to wait. 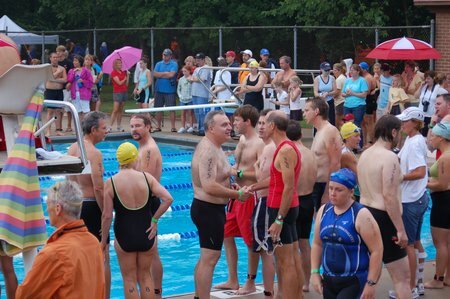 With 450 participants, it was a little crowded on the pool deck as we waited our turn. I spotted some friends and we passed the time chatting. Gayle pointed out that the dad of Sara’s boy friend was doing the race. I had not met him before and Gayle documented the “meeting”. Finally it was my time to swim. They let us get in the pool and push off the wall for this race. I liked that much better. I felt good about the swim, even though I am slow and a bunch of people passed me, I just kept to my rhythm and pace. On the last lap, the lady in front of me stopped and stood up, blocking the lane. It messed me up. But I took a couple of breast stokes and was able to get around her, recover. I headed to the stairs out of the pool and to the transition area. The rain had stopped by this point but the road was still wet. The bike route had been described as rolling hills. Here is the elevation chart from mapmyride.com. The hills were not that bad, I was constantly working the gears. The race folks had warned us that the last 3 miles of the bike course were “rough”. I had talked with several folks that had done this race before and they said that the road was heavily patched. It was terrible. It was the one place where it was down hill to flat that I could have made some time up but felt I was all over the road trying to find the least bumpy path. As I headed up the final hill to transition, I saw Gayle. Changed shoes and headed out for the run grapping a cup of water and a gel as I left the transition area. Had a great run and felt strong. I don’t remember being passed by anyone. One of the “cool” mind games I play when doing a tri is ” I can beat this guy.” When they do the body marking, they write you age on your left calf. So when you come up behind someone, you see their age. So my version of this game is “I can beat this guy, he is 34 or whatever.” It is a great motivator. I had less than a mile to go and I was about to pass a lady who’s age on her calf was smeared but I though it said 54, my age. She was doing great and really looked strong. As I passed her, I told her she was doing great. A second to two later, she responded, “Old people rock!”. I knew she had seen my age. I told her they ought to give us extra points for being out here. To which she responded, “like in golf”. Made it to the top of the last hill and across the finish line. Glad to be done because the humidity must have been 100 percent. Amy was at the house at 6 am and we headed to the Cadillac Firecracker 5k at the Maryland Farms Y in Brentwood. 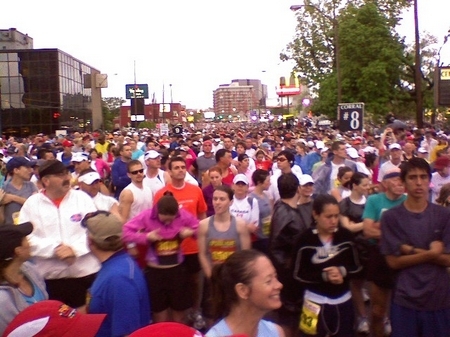 This race has grown into one of the largest local races of the year. We pickup our bibs, shirts and chips and headed back to the car to drop off the shirts. We saw several folks from church and some running friends as we waited for the the race to start. The sky was lightly overcast, so it had the promise of being one of the cooler race days. But almost on cue, when the gun was fired the sun broke through the clouds. It then became two races, once against the clock and the other against the humidity. Finished in 24:04, 27 seconds better than last year. The most encouraging part was that there were a lot of old men that showed up this year, 61 in the 50 to 54 age group and I came in 11! 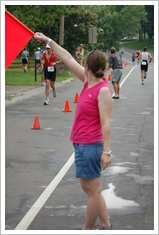 Lisa removed my chip, I grabbed a Poweraid and banana and walked back to the finish line to watch Amy finish in 29:17. We hung around for a few minutes and then went by Panera Bread and pick up some bagels for the family. Amy and I had talked about riding when we got home but the heat had taken its toll on her. Later this afternoon, Sara and I did an easy 8 mile ride. 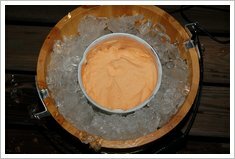 This evening we grilled hamburgers and I made some orange sherbet, the Haywood traditional Fourth of July meal. Got up at 3 am, shaved, ate breakfast and loaded up the car. Gayle and I were on the road by 4:30. Needless to say the traffic was light that time of the morning, so we rolled into the parking lot in McMinnville a little after 6 and headed to pick up my packet. Set a text message to Michele that we was there and got one quickly back that she was on site too. While waiting in line to register, I saw Stephen. Headed back to the car and started collecting my gear. Michele came by and helped me get set up. We visited for a little bit then I headed for the pool for a practice lap. Caught back up with Stephen and his family. Soon it was time to line up for the swim. Just like the GJCC Tri, Team Magic, the race management company, had us jump in the pool. The difference this time was we were starting in the deep end. It finally was my time to go. This was by far the best swim of the three races that I have done. I am by no means fast but I didn’t feel like I was struggling in the water. There were a couple of times my Velcro watch ban came loose and I had to adjust it. 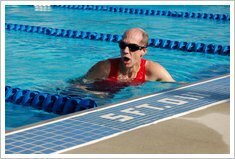 But I made the adjustment and then picked back up with the swim. Made it to transition and out on the bike. The course was rolling hills with most of it on a by-pass. The grades were long but not that steep. The main factor was a strong head wind on the way out. A couple of times the cross wind felt like it was push you over. Kept playing tag on the bike with one lady. As I headed back to transition, I saw Gayle. When I got to transition, there was my new bike “friend” right next to my spot. I told here that she just thought she had gotten rid of me. She said that I would take her on the run and off she went. I racked my bike, changed shoes and headed out. I saw Gayle again as I headed out for the run. Caught up the bike lady about a half mile out and she stayed with me until a hill about a mile later. The run went well and I made it back to the finish. As I crossed the line I saw Gayle and Michele. The cold PowerAde tasted great. Hung around for a little while then Gayle and I headed back home stopping in Manchester for breakfast/lunch at Cracker Barrel. When we got back around 1, Sara was heading out with her boy friend. So with the house quite, we both took naps. 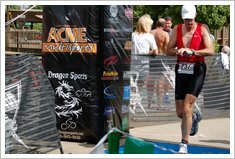 The race was 350 yard swim, 15.5 mile bike and 5K run. My time was 1:36. It leaves room for a lot of improvement but most of all I had a great time doing it and didn’t feel beat up when I finished. And of course, Gayle was a real trooper for coming along. This is race is one of those races folks want to do as much for the T-shirt than anything else. Why else would one want to get up and drive before daylight to a small town to run 10 miles of hot and humid hills on the first day of summer? Was out the door before 5 am for the hour-long drive to Bell Buckle, Tennessee. It was overcast and I could see lighting in the East. There was a threat of rain which was all right with me as long was it was not like the Tom King in March. Pulled into town a little past 6 and was directed to a field beside the railroad tracks to park. Which cost $5.00. I guess it is cheaper than a speed trap! Walked over to get my bib, chip and shirt. Lisa was helping direct folks. 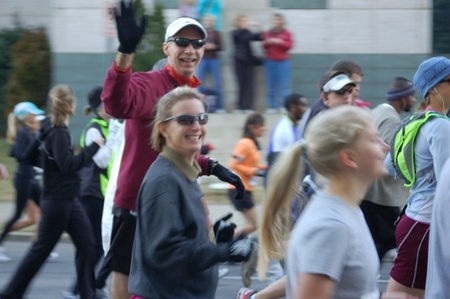 Just before the race started, Jill found me, so I had a running buddy. Just about the time the race started the sun broke through the clouds and the heat was on. The course is rolling hills with the steeper ones in the first 4 miles with the biggest hill between mile 4 and 5. I hung with Jill until we started up the big hill. She told me to go on and she would catch me on the back side. I plodded up the hill. About mile 7, the clouds rolled in and the humidity increased but no rain. The last hill is at mile 9 and someone had painted on the road, “Rest Stop, 1 mile”. I was glad to get to that point…. I was hot and tired. Made it back to town and crossed the finish line in 1:28:47. That’s a PR, beating my time two years ago by 7 minutes. Headed to the food tent where they had fruit, popsicles, chicken and sausage biscuits and of course, RC Colas and Moon Pies. Found Keith, James, Chris and Jeff and of course Jill before heading home. I am discovering as I get older the truth in this statement, particularly as it relates to age groups and races. 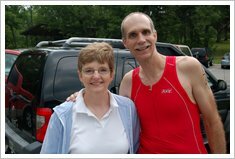 Gayle and I left the house about around 5:45 for the Gordon Jewish Community Center Memorial Day Triathlon. 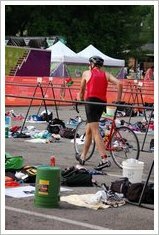 This is a great sprint tri that focuses on beginners (200m swim, 8.5 mile bike and 2 mile run). This is the second year that I participated so I felt a little less apprehensive going into it. When we got to the Center, the parking lot was filing up. Folks were prepping their bikes and gathering their gear. I left Gayle at the car and went and picked up my race packet, number and chip. The line was moving slow but I finally got everything and headed back to the car. Got all my stuff together, checked the air in the bike tires and headed toward the transition area. Got body marked and then set up my stuff. By then it was 7 am, just hung around with my friend Stephen from work. Finally they started lining us up for the swim. Last year, they had us get in the pool. When it was our time to start we ducked under the rope and stood by the wall until they said “Go” and off we went. This year was different. The had us stand on the edge of the pool and then jump in when they said, “Go”. From that point on the swim was a disaster! I struggled through and was just glad to make it out. T1 went smooth and was on the bike in no time. This was my first race with the bike I purchased last summer. I could really tell a difference. A lighter bike really makes a difference. The course is rolling hills with one big hill just after mile 5. Made it back to the Center and didn’t crash getting off the bike. Changed my shoes and headed out for the run. As a ran out of the transition area there was a water station and I took some PowerAid from Lana. It is really funny running after biking, you just feel like you are barely moving but you know you are moving faster that you feel. By this time it was getting humid and I was just ready to be done. Made the turn and headed back to the finish line. As I made the final turn, I heard Lana cheering. I found Gayle and we hung around for a few minutes until Amy found us. She had trouble getting to the race because the roads were closed. I am glad she came. Loaded up my stuff and headed home. 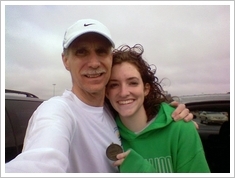 About 11:00, Stephen called to say that I won 3rd place in my age group for beginners. I couldn’t believe it! I had only done a 1:15 better than last year and was last place in a field of 12. This year I was 3rd in a field of five. Sometimes it increases your odds by just showing up…even for old guys like me. 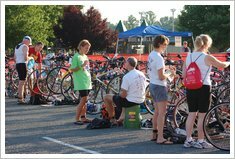 This is the time of year when there are a number of races to choose from every weekend. There were two within a couple of miles of each other in my town yesterday. But again for the 4th years I ran the Tennessee Baptist Children’s Home Run4Kids 5K. For no other reason, that it really is a local race. 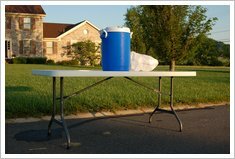 You see the course passes my house twice and there is a water stop in my front yard. It is hard to get more “local” than that! 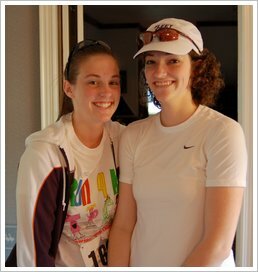 This year, both Sara and Amy signed up to run. About 7 am, we headed out the door and walked to the start. This year, they claimed the race was “chip timed”, so we picked up our chips and headed to the starting line. Saw a number of friends as we waited for the gun, Todd, and Jeff along with David S. What was curious, about the starting line was there was no chip mat only two orange cones, one on each side of the road. We positioned ourselves near the front. The gun fired and off we went. The course is rolling hills and a large part if it is on the roads that I cover most days, so I felt like I had the “home court” advantage. I have placed third in my age group the last two years, so I was hoping to move up. But being at the top of my bracket, I also hoped that some young speedster had not just turn 50. 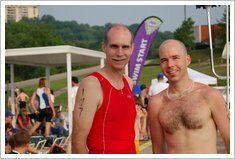 Todd and David S. both placed second in their age groups. At the last minute, Amy decided to stay and pace Sara. Sara has done a few 5Ks before over the years but never really has prepared adequately. Her goal this time was to run the whole course. With Amy’s help, Sara met her goal. I told Amy that she was “paying it forward”. Saturday afternoon, I also did a “brick” to get ready for the GJCC Tri on Memorial Day. Rode 8 miles and then ran 2 miles. Just wanted to practice the transition and running after riding. I was awake before the alarm went off at 3 am Saturday morning. I slept better that I had the previous two nights but it still was not what I would consider a “good night’s sleep”. Something started blooming in Middle Tennessee Tuesday, and I had not been able to breath or sleep well since. Anyway, I got up and checked outside. It had not started raining. Checked the radar and it was only a matter of minutes before I heard the rain on the roof. Got Amy up at 4:00 and we were pulling out of the driveway around 4:40. It was a little later that I had wanted but I know we would be ok on the time. As soon as we merged from I-40 to I-24, the traffic was backed up to get off for LP Field. I knew that was not good. So we headed to the next exit. No problem. We had just parked and I got a text message from Michele. They were stuck in traffic on the ramp. The time stamp on the message was 5:01. It was still raining as Amy and I headed to the buses for the ride to Centennial Park. Didn’t have to wait and walked right onto the bus. When we got to the park, we headed over to the other side where I knew there were park bathrooms and shelter. The covered area was already full so we looked for an alternative. 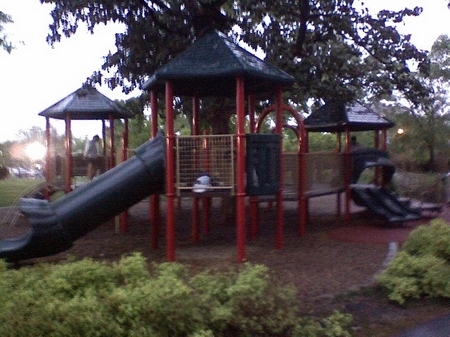 Next to the building was a playground. We headed over there and staked a claim in one of the tree houses. I had brought an extra garbage bag. We opened it up, set down and waited. Amy decided to lay down and rest. Got another text from Michele a little after 6 that she and Ronnie were finally on the shuttle bus. Around 6, as it was getting daylight, the rain let up. But around 6:30, it started up again. By that time there were more folks at the park and it seemed the folks were scurrying for a place to stay dry. We were joined by another dad and his daughter and a husband and wife. It quickly got crowded in our tree house. Amy and I had worn an old pair of shoes to park. So about 6:30, we changed into dry shoes and socks. Even though it was still raining as we walked to the corals, it was good to at least start out dry. Michele and Ronnie finally made it to the park and we met up, checked our gear and headed to the corals. Amy was in 19. I was in 8. In looking behind me, there were runners as far as I could see. The rain stopped around 7 but Michele and I kept our “rain coats” on until the last minute. This race uses a staggered start. Around 7:12, we crossed the start line and we were off. We had enough room to settle into our pace and it didn’t seem too crowded. Through the early miles we are within a minute of a 4 hour pace. The course is basicly three out and backs, Belmont, Metro Center and Shelby Park. As we started out the Belmont segment, we saw the elites coming back. As we came back up Belmont, we saw Ronnie and Amy. As we turned onto 12th Ave., we hear Rachel cheering for us. We hit the 10 mile mark with 30 seconds to spare…right on pace. Around mile 11, the half marathon course headed for LP Field while we headed up the hill toward Metro Center. At the top of the hill, is a convent and it is always fun to see the nuns, in full habit, cheering for the runners. There was a water stop beside them with a sign that read, “Holy Water”. As we headed down the hill, Jill met up with us. It was great to see her. We turned the corner and hit the 13 mile mark with a minute to spare. We were doing great. But around mile 16, the wheels came off the bus for me. I started having trouble catching my breath. I don’t know if was the honeysuckle that was in bloom by the river or what. I finally had to tell Michele that I had to drop back. 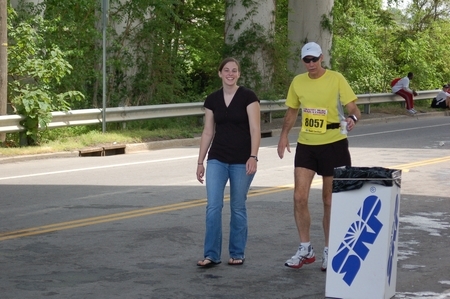 Jill caught up with me round mile 18 and I ran with her for a short time. But it didn’t take long before I couldn’t keep up with her either. After I pasted mile 20, I called Gayle and told her where I was and that I was slowing down. Amy had finished the half. Her time was 21:19, an new PR for her. On the out and back to Shelby Park, I spotted Michele. She had a little more than a mile to go and her time at that point was 3:45. Told her the time and knew she was going to make it under 4 hours. With less than 2 miles to go, I spotted my daughter Sara. She had come to keep me company. It was really good to see her. At first, I had trouble talking with her. I still was having a hard time catching my breath. But will her along side, I was able to pick up the pace some. Sara told me that Gayle and Amy were at the last water stop waiting for me. When we got there Amy joined us and Gayle followed along as we all headed toward the finish line. They left me at just before the 26 mile marker so I could shuffle over the finish line at 5:09. Needless to say, the day didn’t turn out the way I had wanted but at least it was a course PR for me. I have not had very good experiences on this course the three times I have done it. Congratulations to Michele, 3:57, you did great. Thanks, Jill for the support and encouragement. And thanks to Gayle, Amy and Sara, you guys are super! We set three PRs yesterday, Amy, Michele and me in less than perfect conditions. With my bad luck for race weather, the forecast for Saturday morning called for strong storms and heavy rain. All I can say is that the forecast was on the money. Amy come over Friday night for pasta and then spent the night. It was raining when we left the house a little before 7 am. Before we turned on the I-65 to head north to Nashville, I saw the first bolt of lighting. When we got to LP Field, I called Michele and we parked near her. Amy and I got out the umbrellas and headed to the stadium to get our shirts, bibs and chips. By the time we got back to the car, we were already wet. We changed our shoes and socks. I had already put Body Glide on my feet before I left the house. I was glad I did. As we were getting ready, Michele came and got in our car. I realized that I had left my Garmin at home, not a good thing. 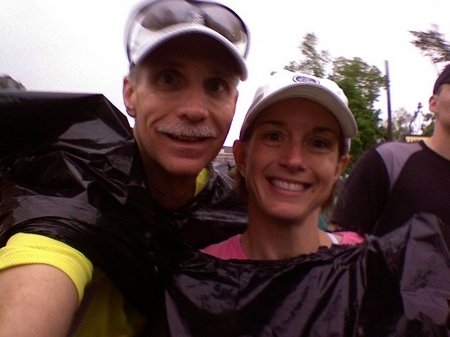 Wearing garbage bags to keep a little dry, we headed back to stadium for one last trip to the bathroom before heading to the starting line about 7:45. It was still storming as we headed to the starting line but at least the rain was not a heavy down pour. It was the lighting that concerned me. The gun went off and we started moving toward the starting line. I kissed Amy. Wished her well and told her I would come back to run the last mile or so with her. Michele and I took off. We were aiming for an 8:30 pace. That would give both of us a PR. The first mile it took some getting use to the rain. My hands and feet were cold but they soon warmed up. My feet were wet and just continued to get wetter. The course is very flat for Middle Tennessee. It runs out to a park and then on a greenway that borders the Cumberland River. It is basicly an out and back course. Once you get on the greenway, there is not much room to pass other runners, especially when you start meeting the folks that are already heading back. We kept our pace and did OK getting around runners when we needed to. After making the turn, we started looking for Amy. If she was struggling, I had decided that I would cut over and run with her. We spotted her. We were around mile 7 and she was around mile 5. We started cheering and Amy was all smiles. She looked good. I knew she was doing well. Michele and I trudged on. By now, there were parts of the greenway that were totally flooded. There was no way around the water. We made it back to the stadium and down the ramp and out on to the field. The turf was mush. By staying close to the wall, it was firmer. As we made the last turn with 50 yards to go, Michele took off. She set a PR of 1:50:23. I was a few seconds behind at 1:50:27. We collected our metals, had our chips removed and head back out to meet Amy. The wind was gusting from the South and we were heading right into it. As wet as I was, I was getting chilled. We met up with Amy about a mile and an half from the finish line. She was still in good spirits and all smiles. She was doing great. When we got to the South end of the stadium, Michele turned left to go watch us finish. When we got in the tunnel under the stadium we were the only runners there. The security workers started cheering us on. It was really cool. But when we came out of the tunnel onto the field, we heard folks cheering for Amy. I was really special. Amy was smiling and teary-eyed. It was a really special to be there. As we made the final turn, once again I was left behind. 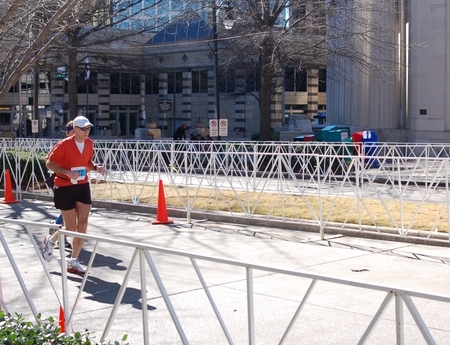 Amy took off and sprinted toward the finish line to the cheers of her friends and family. She finished in 2:28:02. Amy got her metal and we headed up the ramp out of the stadium. When we got to the street, there was all of her fans, Gayle, her roommate, two friends and Michele. Amy was the star. It is really easy to forget what an overwhelming accomplishment completing a half-marathon can be and all the life lessons one learns. Amy said to me today, it is as much about the journey as it is the race. Since I forgot my watch, Michele sent me our splits…. Gayle and I drove down to Birmingham Saturday afternoon. It was a beautiful day for the three hour drive South. Rolled into town a little after 3:00 pm and checked into the hotel. 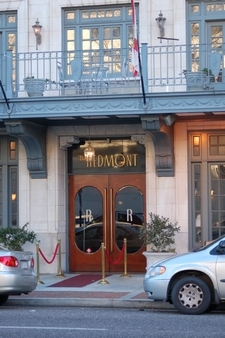 We stayed at The Redmont. It was an older hotel that had been updated and remodeled. It was only about three blocks from the start/finish line. After we checked in we headed over the the expo to get my race bib and chip. We had just started walking around the expo when Michele called. She had just picked up her packet. There were not many vendors so it didn’t take long to see everything before heading back to the hotel. The three of us headed out to Macaroni Grill for supper. I called ahead for reservations and the girl told me yes they take reservation every evening except tonight and 14th. I guess they knew there was a big market for pasta on that night. Met Michele at 6:15 Sunday morning and we headed over to the start. The temperature was 34 degrees and the forecast was for a high near 60 with the wind from the North. We had debated about what to wear since there was such a temperature change during the race. I settled on a long sleeve shirt and a throw away sweatshirt. I had pick up some free cotton gloves which were great for the start. Since it was just a short walk to the start, we still had about 30-minutes to wait. I spread out my trusty garbage bag and we sat down to wait in the coral. Knowing we did not want to start out too fast, we position ourselves near the 4:15 pacer. The plan was to hold back for the first could of miles and then re-assess about the first big hill around mile 6. Soon the race was underway. We spotted Gayle, the official photographer. We stayed with the pace leader for first 2 to 3 miles before moving ahead. It was interesting to learn that she paces marathons every weekend. Needless to say, she knew what she was doing. Michele asked the pacer about the hills. She said the first tough hill is at mile 6, but the one at 22 is where she usually looses people. The first several miles are in the downtown area and are flat. By mile 2, I had warmed up enough to toss off my sweatshirt. We started up the hill at mile 5. It was not that steep, just long. The next 3 miles were rolling hills. Nothing big but enough to know that you were not in the flat lands any more. The half-marathoners, split off before mile 9, while the marathon course headed down the other side of Red Mountain. At every split we check our pace. We had gained enough on the down hills to where we were within a minute or two of the magic 4 hour pace. Between miles 12 and 16, the course follows a greenway and then runs through a mall parking log. This is the flattest part in the middle miles of the course. At this point, we felt really good about our time and pace and were confident that we were still within striking distance of the sub-4. Little did we know was lie ahead. As soon as we turned off Shades Creek Parkway, we started to climb. These hills were not the up and down ones like we had after mile 6, these only went up. There was little time for recovery before the next turn and the next hill. By the time we got to the final “big” hill that started at mile 21, I was dragging. We kept moving and finally pulled the final hill. My split for mile 23 was 11:16. The downhill was steeper than coming up. All you could do was lean forward and let gravity pull you down. I flew down the hill in 8:47. By this time I was spent. Michele still had some gas in her tank while I really started to drag. Even though I was back on flat land, my pace was slowing down. I finally shuffled over the final mat in 4:11:11. I was pleased. It was a PR on a tough course. I know I couldn’t have done it without Michele’s help and encouragement along the way. The Mercedes Marathon is a well run race on a very tough course. If nothing else it is a great confidence builder. I’m already looking forward to the Country Music Marathon in April.